On Friday, Nov. 2, Rico Brand and Frida Bistro will host their 11th-annual Día de los Muertos (Day of the Dead) Celebration, with proceeds to benefit the Utah Food Bank. According to Jorge Fierro, founder and CEO of The Fierro Group, Inc., “Día de Los Muertos is a gathering of family and friends to pray for and remember those who have passed away. This is not a day of mourning, but rather a celebration of those who have passed, and the wonderful lives they lived.” The celebration will take place at the Rico/Frida warehouse at 545 W. 700 South, from 6 to 11 p.m., and will feature Mexican cuisine, live music, a cash bar, a Mexican market, kids activities and a clown. The entrance fee for adults is 15 cans of food or $15; for kids it’s 10 cans of food/$10. The celebration in 2011 raised more than $20,000 for the Utah Food Bank, and they’re hoping to do even better this year. For more information, visit FridaBistro.com or phone 801-433-9923. Award-winning artisan salami producer Cristiano Creminelli has teamed up with award-winning whiskey maker High West to produce a unique, strong-tasting whiskey salami. 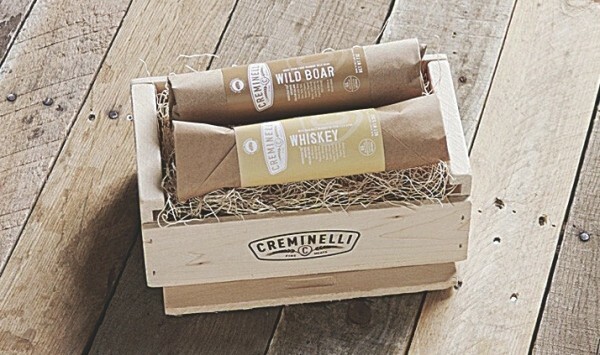 They call Creminelli whiskey salami’s flavor “Go big or go home.” It’s made from free-roaming wild Texas boar, spiced with clove and juniper, along with High West’s Son of Bourye whiskey. This salami will put hair on your chest! By the way, congrats to Creminelli and his crew on being featured recently in The Wall Street Journal for an article about artisanal salami. Find out more at Creminelli.com and HighWest.com. Spanish eatery Finca (1291 S. 1100 East, FincaSLC.com) will host its first beer dinner on Thursday, Nov. 15, from 6 to 8:30 p.m. Finca has invited five Utah breweries—Epic, Moab, Red Rock, Squatters and Uinta—to team up for the five-course dinner, with each course paired with a different local brew. The cost for the beer-pairing dinner is $55, plus tax and gratuity. To reserve your spot, phone 801-487-0699.